The Mitton manor was in the “liberty” of the Lord of Bowland. This was subsumed into what became eventually the Duchy of Lancaster in 1351. On the death of the paramount lord Henry de Lacy (2), the 3rd. Earl of Lincoln Feb. 5, 1311 his only surviving daughter Alice was married to Thomas Plantagenet, Earl of Lancaster. The de Lacy lands upon Henry de Lacy`s death, due lack of a male de Lacy heir, went to his son in law Thomas Plantagenet 1st cousin of Edward II. Both of Henry’s sons had died tragically, one having reputedly fallen off his fathers castle at Pontefract. Thomas, Earl of Lancaster was married to Henry de Lacy`s only heir at his death, Ann. Having pledged this daughter Ann (at age 9) to Thomas Plantagenet, Henry also granted Thomas a life estate to his barony upon his death. Thus Thomas Plantagenet inherited the de Lacy barony as a life estate rather than through his wife by primogenitor. In either case he would have had title as women could not hold lands. The de Lacy barony combined with Thomas Plantagenet’s already extensive lands as Earl of Lancaster made him the largest land owning Baron in England (5 Earldoms) . Twice the next largest Barron. Along with it the military resources to rival his nemesis and 1st cousin King Edward ll. The opposite result of what was first proposed between Henry de Lacy and Edward 1st to seal the two family’s alliance with an arraigned marriage. The two cousins rivalry continued until Thomas Plantagenet was executed by his cousin Edward II in 1322 outside of the de Lacy built castle at Pontefract. Other de Mittons after 1312 continued to hold lands in the area as documented by the transfer of deed to Stonyhurst (in Aighton) by Cecily and Emma de Mitton to their cousin John de Bailey in 1362, However, no “Lord of the Manor” ever resided at Mitton Manor from 1312 on. The manor eventually came to be held by the Aspinall family in the 19th century. 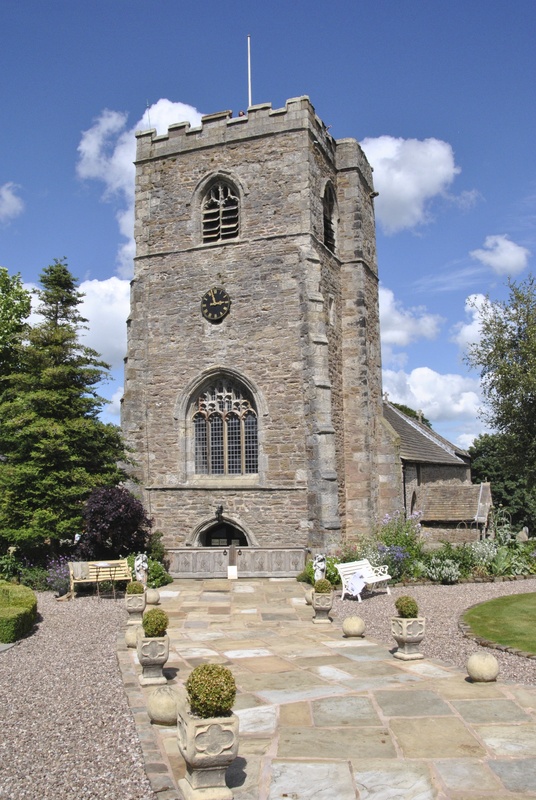 Many other de Mittons continued to reside in the Clitheroe to Craven area as documented in the Clitheroe Court Rolls (over 30). Other descendant de Mittons are recorded in the Bishops Rolls beginning in 1538 in the Craven area about 40 miles to the north east. They were residing near the Ribble river as of late 18th. and early 19th. centuries. Many within the same diocese lands first established by Ralph the Red parish lands from 1103. 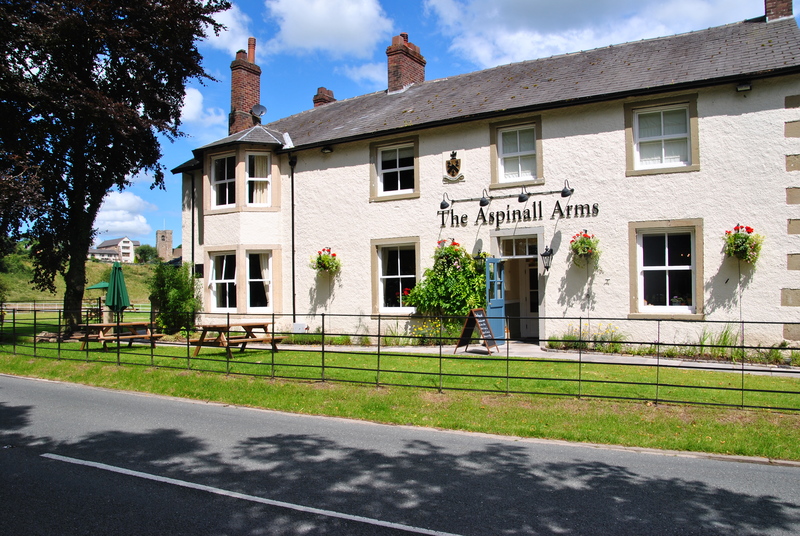 The remodeled (2014) Aspinall Arms below in Great Mitton on Mitton Road in the very heart of Great Mitton. Note; Great Mitton Hall and Mytton Church are to the left in the background across the Ribble River. One explanation for the de Mitton`s migration to the Craven area 40 miles to the northeast of Great Mitton could be the effect of the plague of 1348 that devastated Europe. This wiped out huge populations and made labor much more valuable because there were fewer people to work the land.Thus the “feudal” system could not be sustained and scarce labor became competitive. Manors had to compete for workers and this often meant the former serfs could go to other manors for better compensation. This greater freedom of competitive worker compensation ended the old feudal protective dependence and hierarchy under the Norman feudal manor system. It is not known how much effect this had on this area but the feudal system began its decline as a result of the repetitive plagues over time. Labor became more competitive and could move about as opposed to the previous dependence with little alternatives for labor competition. The Three Fishes at Great Mitton. 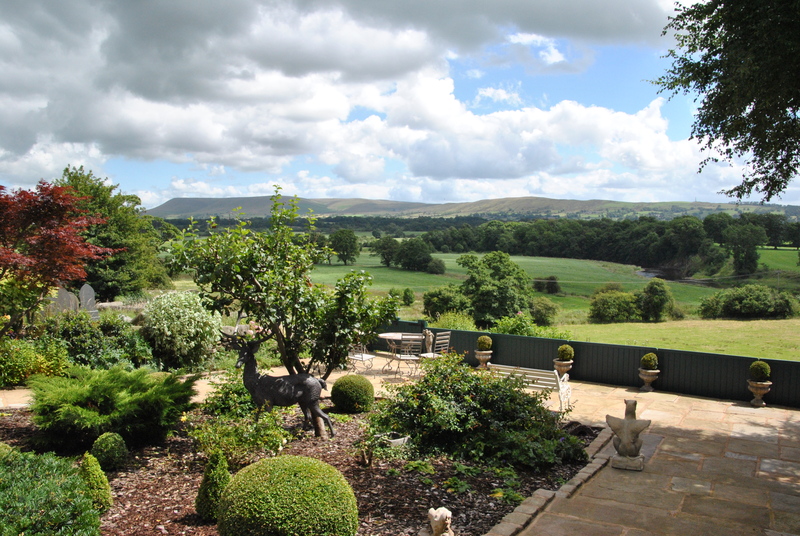 Pendle Hill below from the garden grounds of Great Mitton Hall manor site.